Kite4Girls went off today for the third year in a row with great conditions and an outstanding turnout. 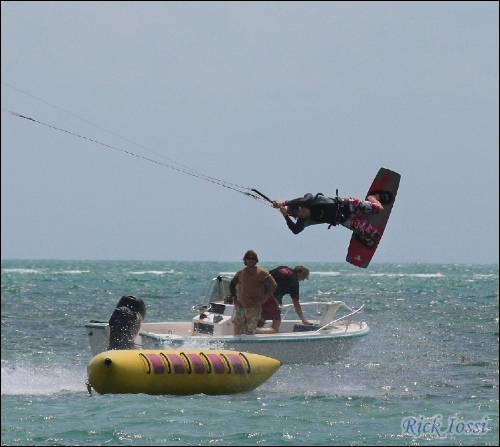 Riders were stoked to tackle X-Rated Kiteboardings boardercross in shallows off Crandon Park. 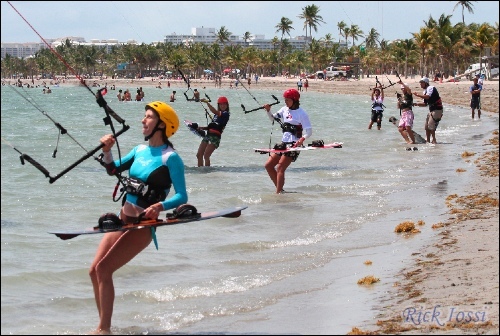 Miami Kiteboarding has done an excellent job in creating and then bringing this fun event back each year. This is just a rapid first look at the day's happenings. I have about 1500 images to go through so there will be another well illustrated article to follow this one. We were so lucky to have this wind pop up in the forecast only in the last day or so. For a second year in a row good winds blew for the event. Guys too, well some guys anyway. George Saunders and FOUR other video crews were present from kiteflix. 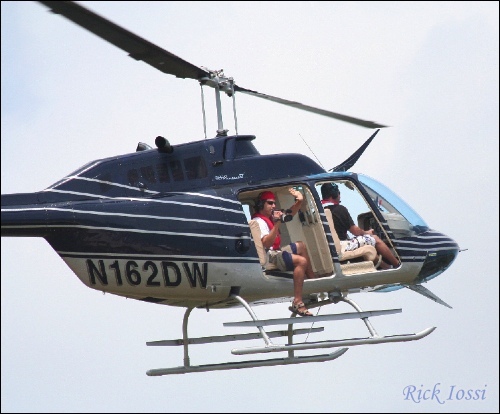 You can see George hanging out of the helicopter to grab some great video. 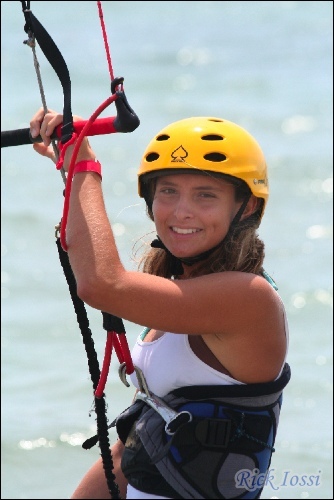 This was the first year that Kite4Girls was officially coeducational. Jessie and his girlfriend ride together sharing one board, harness, kite ... you get the idea. 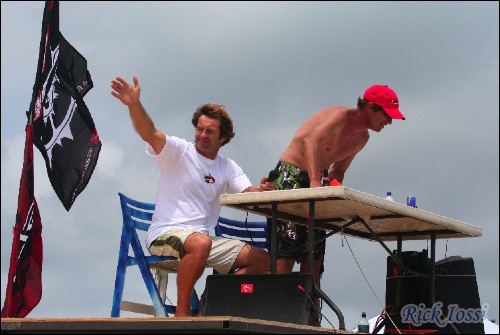 A huge thanks to Christophe of Miami Kiteboaridng, Neil and John of X-RATED KITEBOARDING for all their hard efforts and those of the legions of volunteers and generous sponsors that made this great event possible. Fabian also riding for JN wins the men's comp. How were the closing ceremonies and wrap party? Sadly, I had a prior committment with some 3000 + year old dude and his gizzard head piece and couldn't stay around?! At the raffle right before the closing ceremony I think you won a few items. Thanks for passing the news along! I will give Christophe a call. Hope you had a good time at the event. In the meantime, what do they mean "walk like an Egyptian?" What a great day at the kite for girls comeptition! It seemed to me that everyone had a great time at the beach. We all looked like a big family doing our thing toghether. 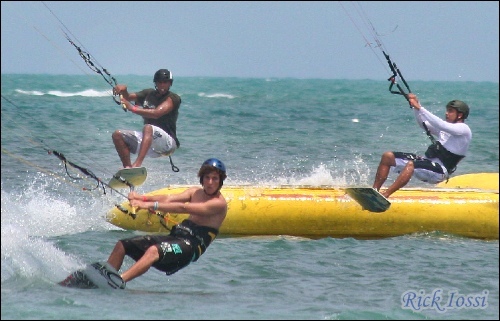 I am glad that every kiter used a helmet and respected all beach rules. What a great oportunity to show other beach goers and city of miami our interest for maintaining this area for our fun. 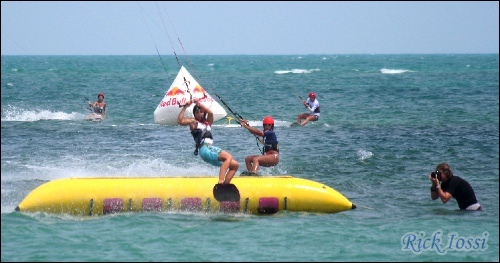 Boys and Girls, this is what kite surfing is all about! May this event and many more like this past one come upon us. Great pictures from Rick..... Hope to see alot more! Thank you very much. The Tampa / St Pete Guys had a great time. 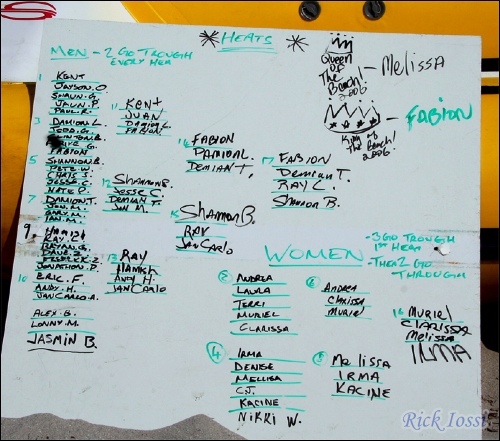 Christoph.. send me your wind button..
Rick- I believe that Neil has your board in the trailer, call him. The after party spot was OVERWHELMED with all who showed up. The food was good, but service was not.No Budweiser products and no habla Ingles. A guy named Chris from Ft Lauderdale got his '05 13m Fuel ripped off, along with his keys and wallet. I got 50 bux towards a replacement kite for him,who's in? Hey Rick, Great job on the review, that was really fast. You're getting really good at these. Had a great time Sat. Thanks to everyone who put forth the effort, it was a lot of fun. Stevil, where did Chris get his stuff stolen from, the beach or the restaurant? That really sux, puts a damper on a great day. Chris got it stollen, right off the tounge of the XRated trailer. I hope his stuff turns up soon and it turns out to be just an accident. Can't me in for a donation to Steve. He really had one of the worst days ever.